NEWS: Leon Sidelined With Concussion At RACE SuperSeries Finale, Loses Out on Chance to Retain Number 1 Plate. The final race weekend of the 2017 racing season was disappointing for the Royal Distributing Superbike Team. Rider, Michael Leon, went into the final double header event of the 2017 calendar with the points lead in both the RACE Pro Superbike and Open Sprint Championships. 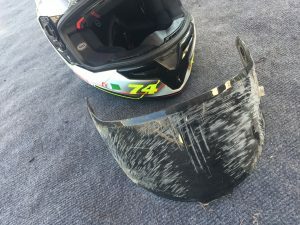 Unfortunately, a crash in the first final of the weekend, on Saturday morning, forced Michael to retire from action for the weekend with a concussion. As a result, he conceded the championship battles to rivals Eli Daccache and Jeff Williams.